More about Bianco Blu White Snowbird Crafted in Fiskars, Finland exclusively for GlassBirds.com, the Bianco Blu White Snowbird is a truly one-of-a-kind piece of art you won't find anywhere else. The bird was designed by artist Tarmo Maaronen and mouth-blown by a small team of skilled blowers. Maaronen was born in 1963 in Urjala, Finland and has been blowing glass since 1979. He worked as a teacher of Scandinavian glass techniques from 1995-1997, until he founded his own glass studio Bianco Blu. While the Snowbird is clear, its body is covered in striking white speckles. 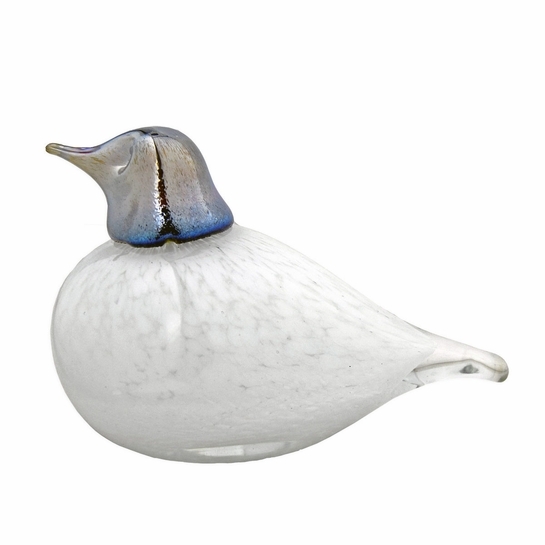 An iridescent head adds alluring contrast, and two indents depict the bird's alert eyes.